The markets in 2015 have gotten off to a very volatile start, but those same markets have also contributed to the best start to a year for rising gold prices in a long time. That is a good sign for the precious that has seen a drop in its value for two consecutive years. Gold investors have been seen smiling a lot lately. So what is behind the resurgence in gold? A lot of it has to do with central banks trying to manipulate the values of their currency, especially when two of those countries are Japan and Switzerland. Both have tried to devalue their currencies to stem inflation. When stable economies like Japan and Switzerland do this, they make their once stable currency more volatile, so investors react by looking for more stable investments such as gold. This drives the price of Gold back higher. The price of gold is up over 6% on the year. As the central banks have tried to manipulate their currencies it has also driven up the value of the American Dollar; it’s no secret that gold and the dollar often trend together. The gains are even higher when you value gold based on other currencies. Gold is at its highest level in Euros since 2013. 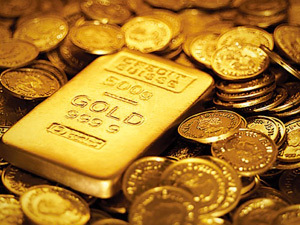 Gold has long been an investment source that investors turn to in times of volatile markets and economic uncertainty; as the world looks for the volatile trend of economies and the markets expected to continue, many analysts see gold going up as much as another 11% by the years end and close at around $1400. With gold gaining over 5% in the last few weeks and reaching a four month high, the analysts may be right on with their predictions.